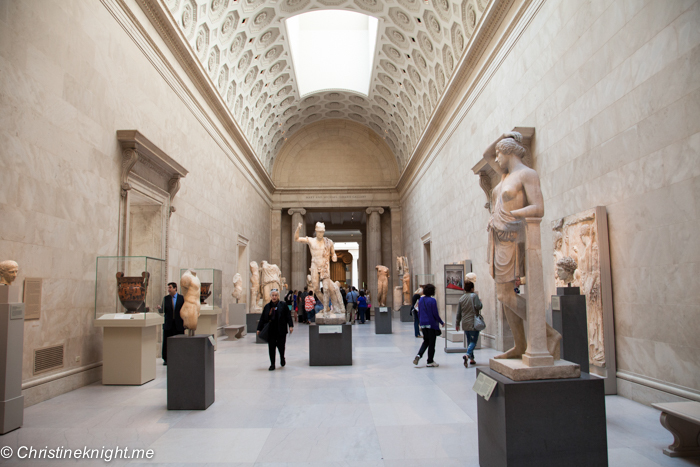 Museums & Galleries Archives - Adventure, baby! 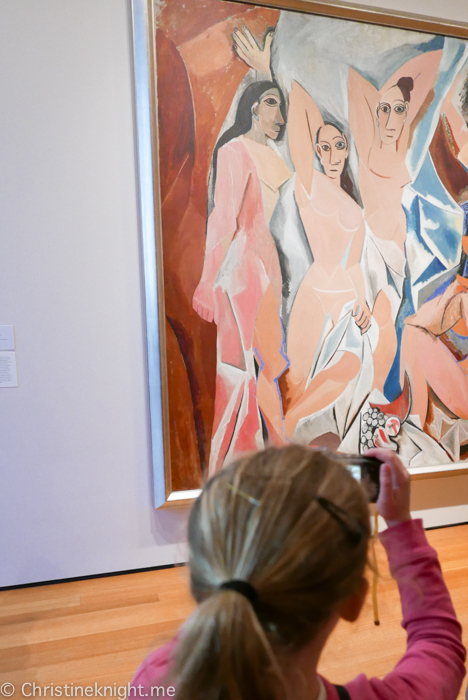 One of the largest and most influential museums of modern art in the world is also one of the most welcoming to children. 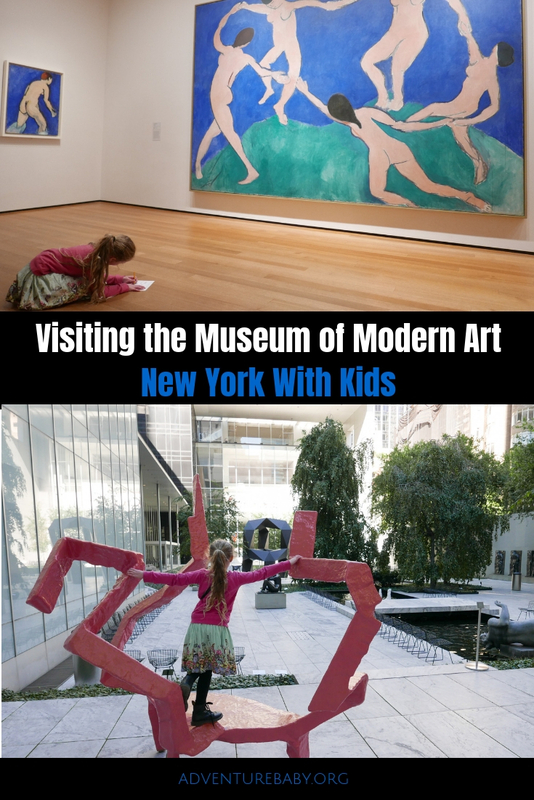 The Museum of Modern Art (MoMA) is a place to take kids to encourage their creativity, let them explore and, most importantly, have fun. 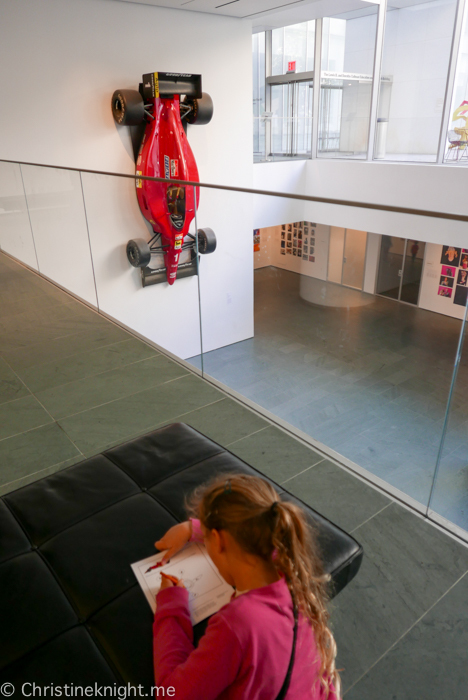 Kids, especially younger ones, can be a tricky mix with an art gallery, as kids love to move and art loves to basically stand still on a wall. 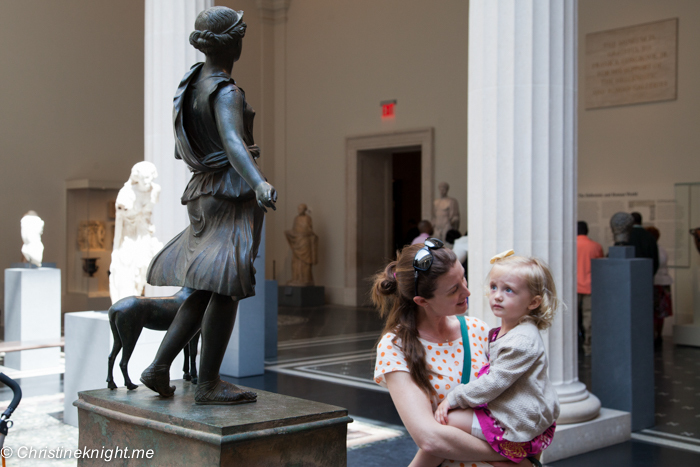 However, art galleries and kids can work and even be fun. 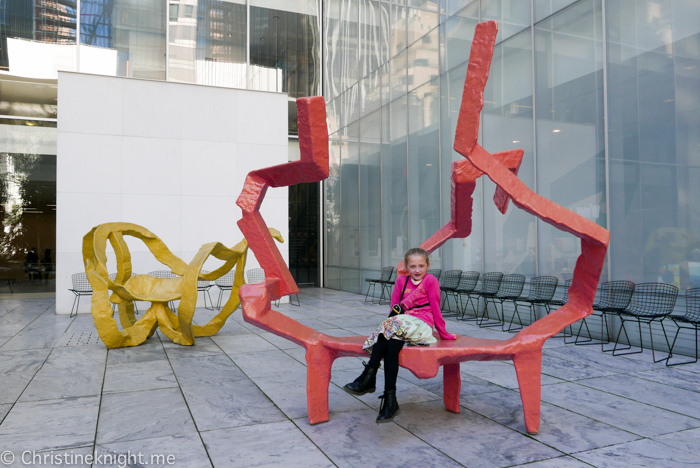 Here are my tips for ensuring everyone enjoys the incredible MoMA. 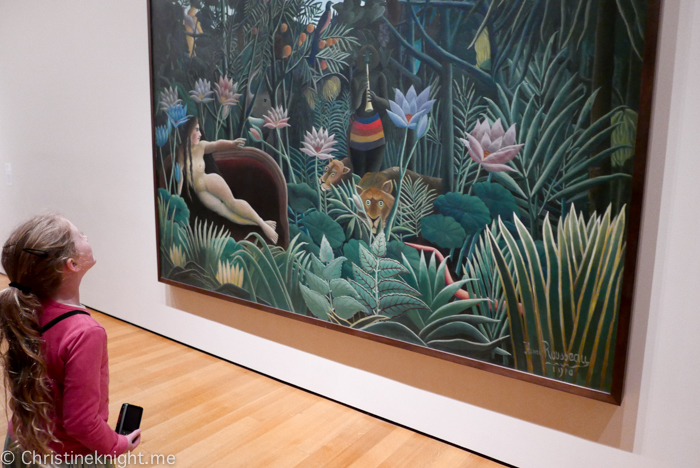 Have a quick chat before you go in about what modern art is, and what they are going to see and do at the museum. Paintings! Photographs! Sculptures! A helicopter! I find it helpful to tell kids what is on offer for them to do, and then what you’re going to do that you want to do (ie look at the art!). Also important to discuss in advance. 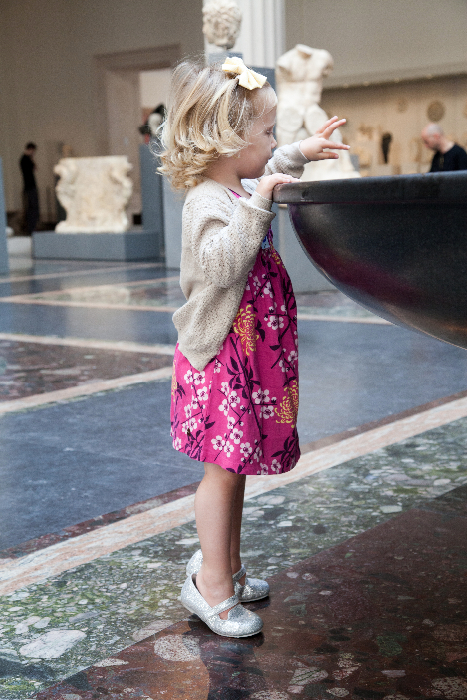 Explain especially to younger kids why they can’t touch the art because the natural oils on our fingers can leave harmful prints. Tell them to ask before touching anything as a general rule. A quick look at the website will tell you what special exhibitions or permanent works are on display. 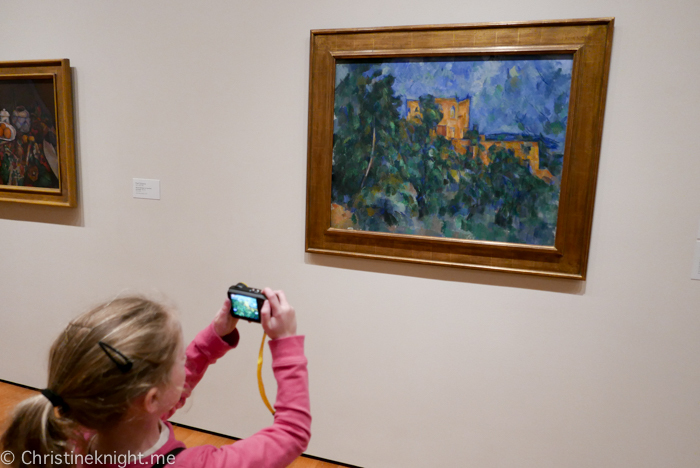 I choose the Impressionist gallery for our visit because Cheese has read books on this art period and I knew she would be excited to see the paintings in real life. 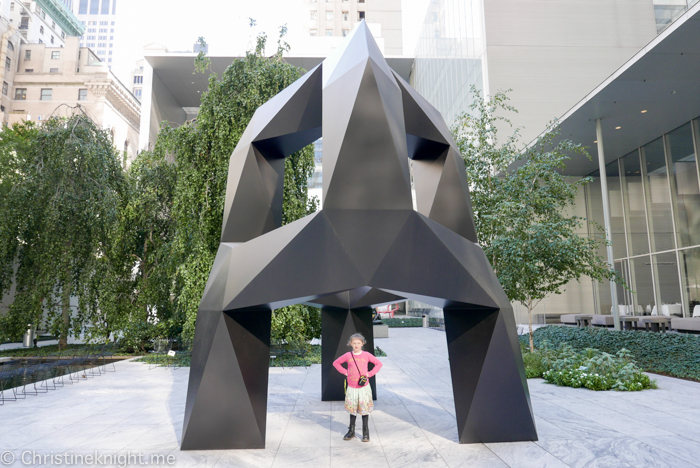 While none of these were on the day we visited, I highly recommend scheduling a visit around a family-friendly tour, art workshop, film, or activity station are offered offered seasonally on the weekends for families with kids ages 4–14. There is also the “Create Ability” program for those with developmental and intellectual disabilities. See moma.org/family for more info. 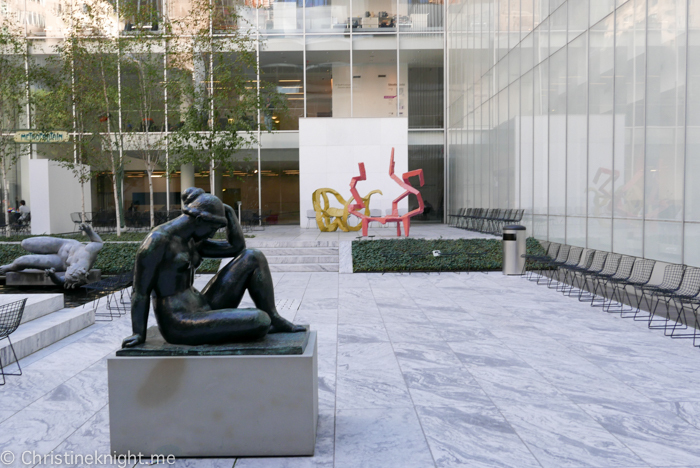 The MoMA is huge and while it’s tempting to see everything, particularly if you are visiting the city and won’t have a chance to come back, aim to spend about 30-90 mins including breaks. 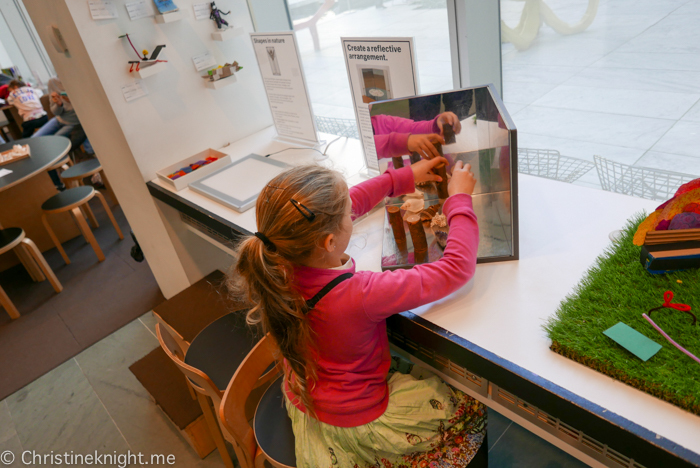 Longer if your kid gets obsessed with ArtLab like mine did. 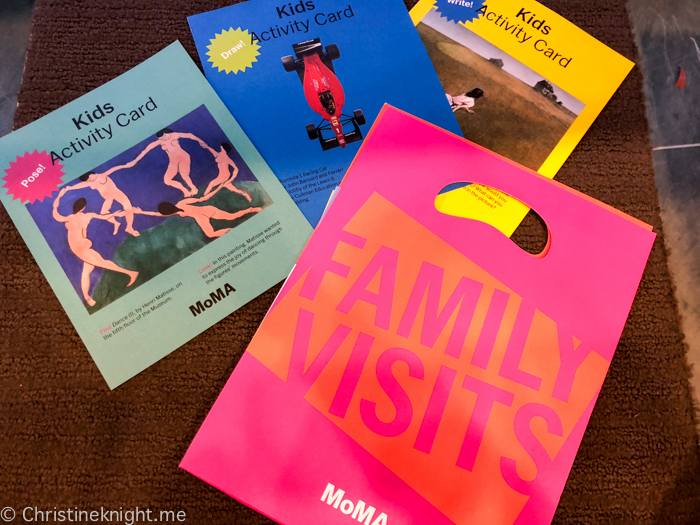 The activity cards contain activities, questions and ideas for looking at pieces of art throughout the MoMA. They are available at information desks on each floor of the museum. 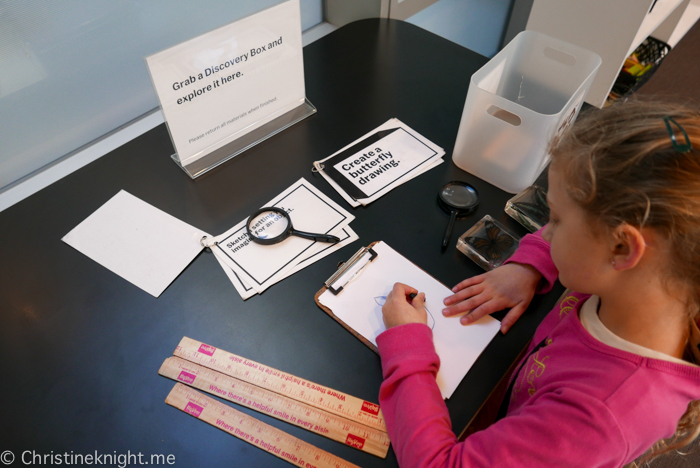 We loved these activity cards and they led us on a scavenger hunt throughout the museum to located the art works and then find out more about them. 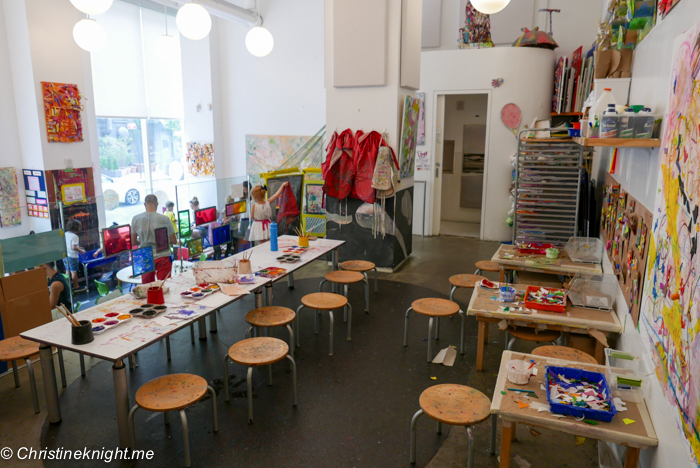 ArtLab is an interactive space that is free with museum admission. 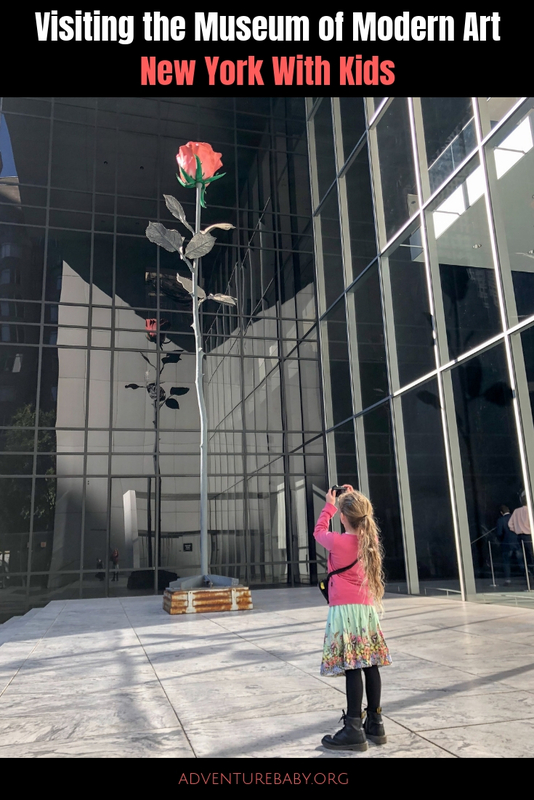 To reach it, walk across the Sculpture Garden or down the corridor on the second floor of the Museum (past Cafe 2), then downstairs to the first floor of The Lewis B. and Dorothy Cullman Education and Research Building. 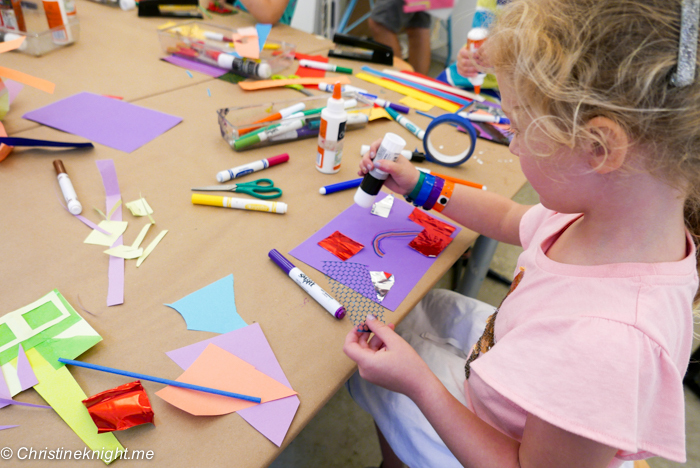 ArtLab lets kids and adults engage with art through hands-on activities. 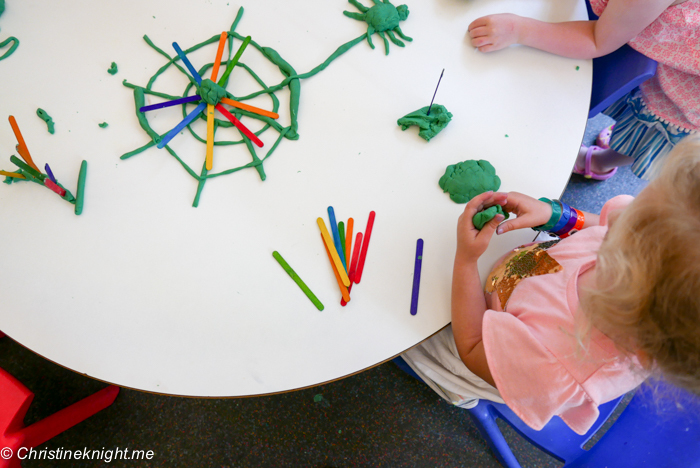 They can play and experiment with different materials and concepts, create masterpieces and contribute to group projects. 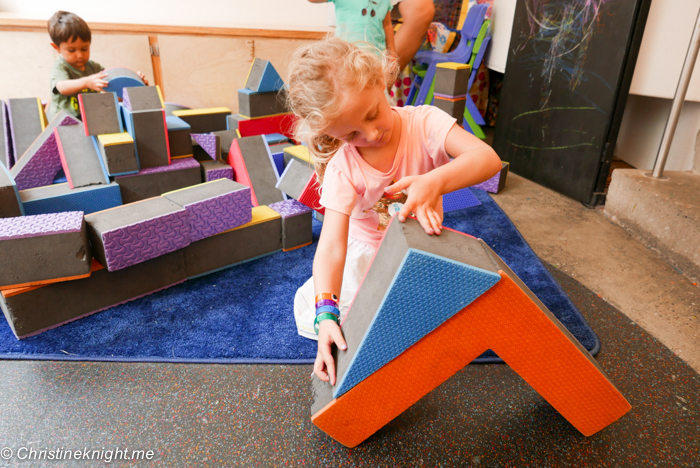 There are activities to engage toddlers through to grade schoolers and even their parents. 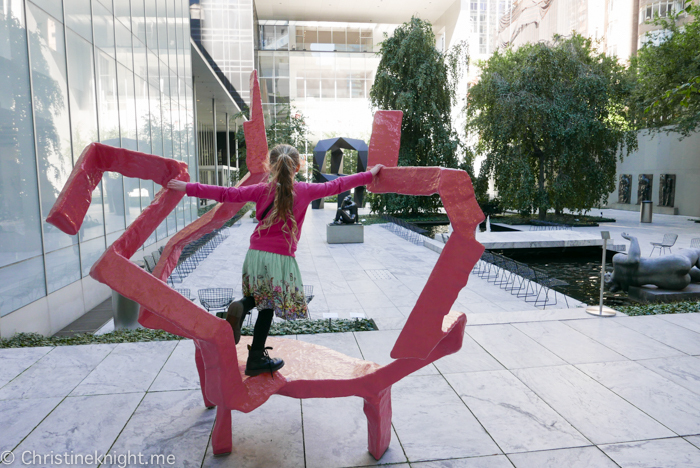 We loved the sculpture garden! 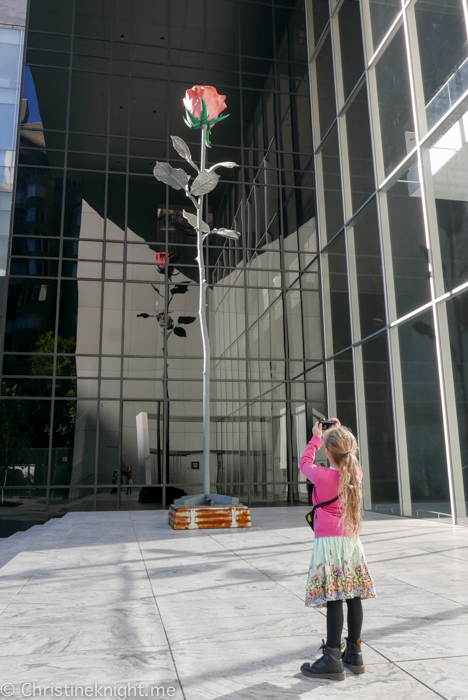 as well as being visually impressive, the sculptures can be walked around or through, and several can be touched. 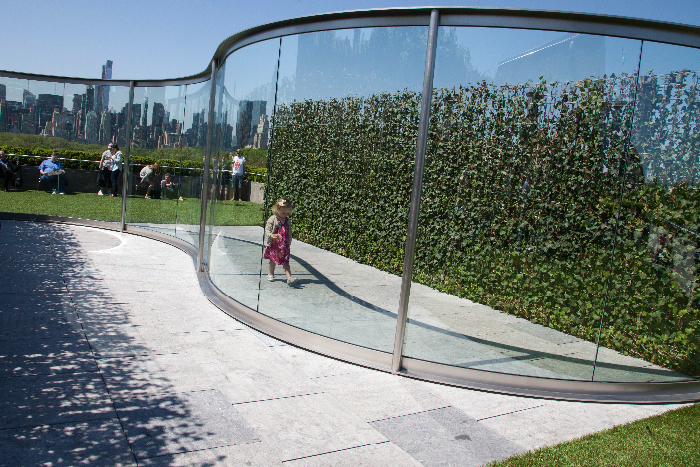 The sculpture garden is free to access even without a ticket to the museum. 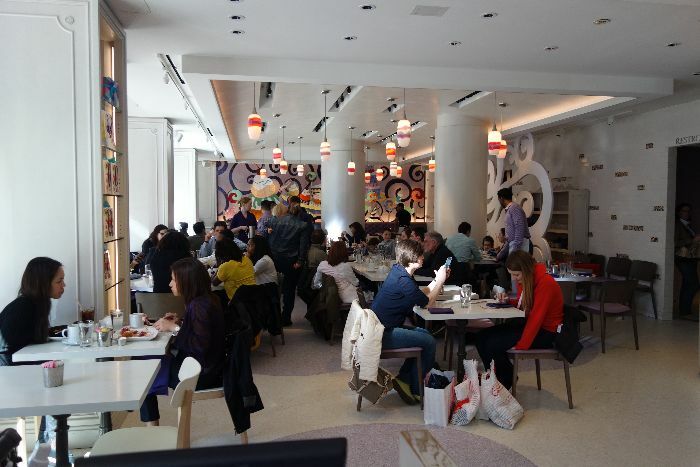 Cafe 2 is the most kid-friendly dining area in the MoMA, with a kids’ menu and high chairs. Cheese ordered the pasta which came with a side of fruit, and I ordered a tomato soup. 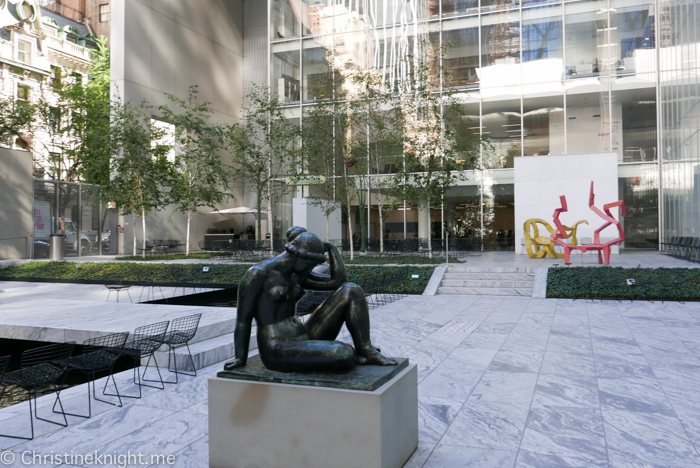 The Sculpture Garden café also offers snacks. level of the Education and Research Building. 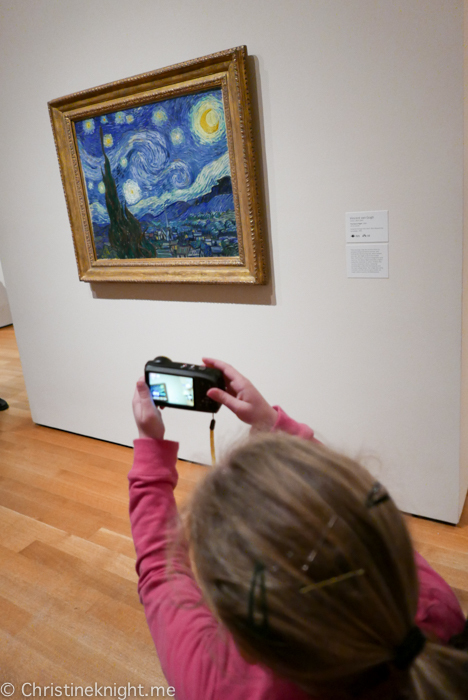 Pick up a free audio tour for kids or download the MoMA app, which has kid-friendly information. 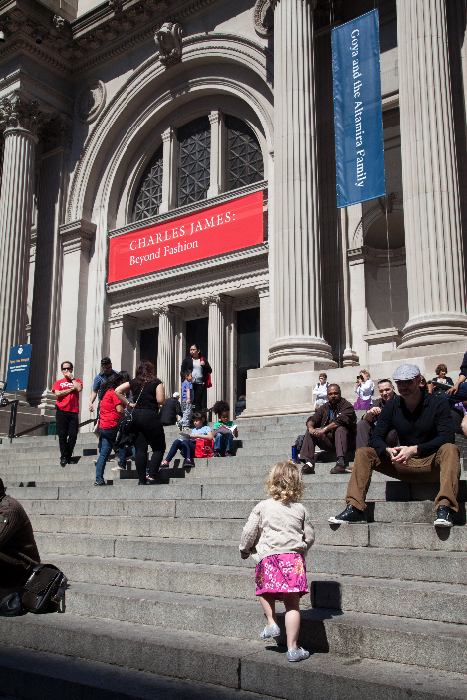 Hours: Daily, 10:30am–5:30pm. Open till 8pm Fridays. 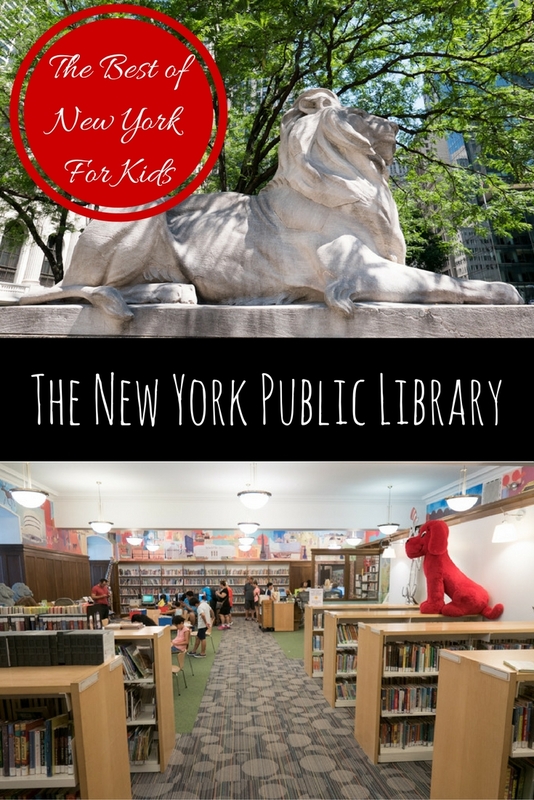 The New York Public Library is great free spot to stop by with kids when visiting New York City. 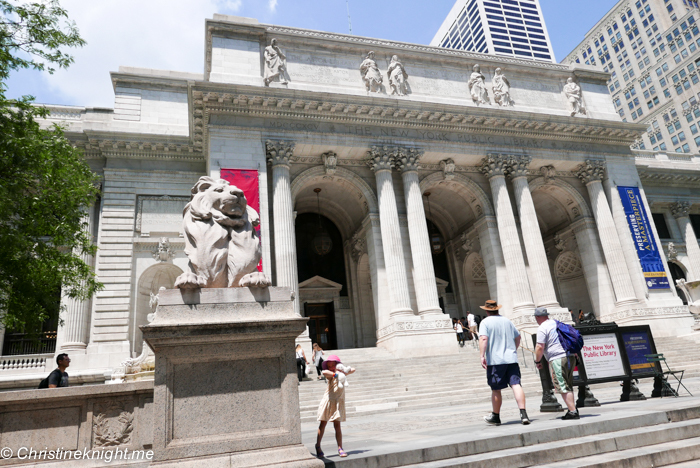 Located on 5th Avenue, it’s the second largest public library in the United States, and fourth largest in the world. 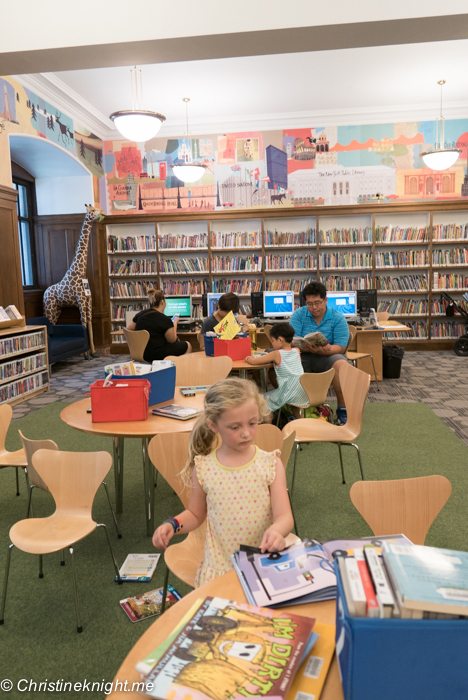 The library is home to more than 51 million items, from books, e-books, and DVDs to research collections. 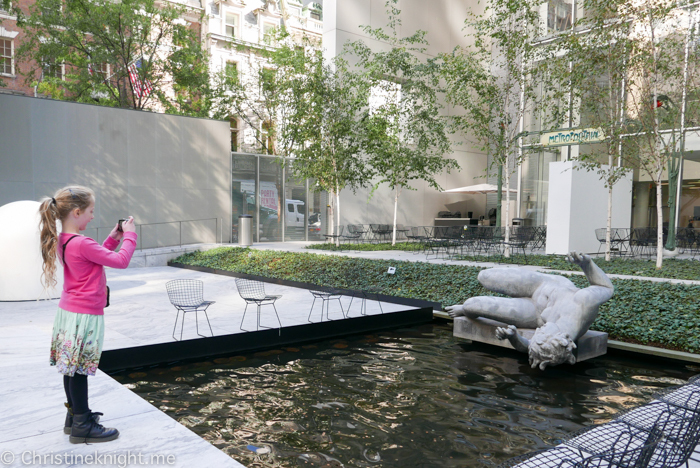 Most tourists enjoy taking a photo Patience and Fortitude, the famous pair of marble lions that stand in front of the buildings entrance at Fifth Avenue and 42nd Street in Manhattan, but don’t venture inside. 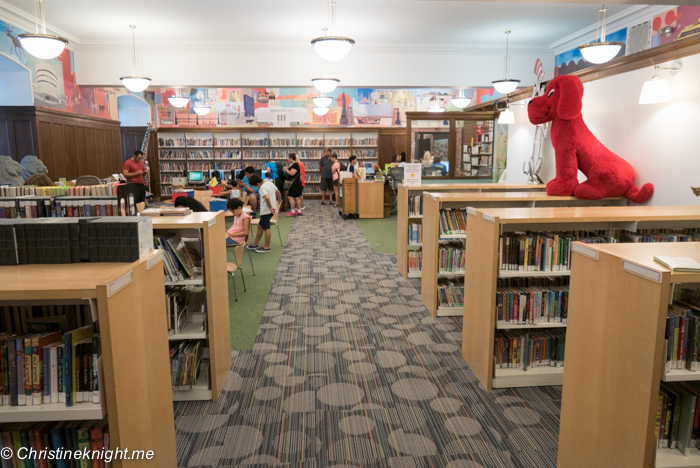 If you’re visiting with kids in tow, I highly recommend dropping by the Children’s Center at 42nd Street to enjoy free access to a wide range of children’s literature, music, and media. 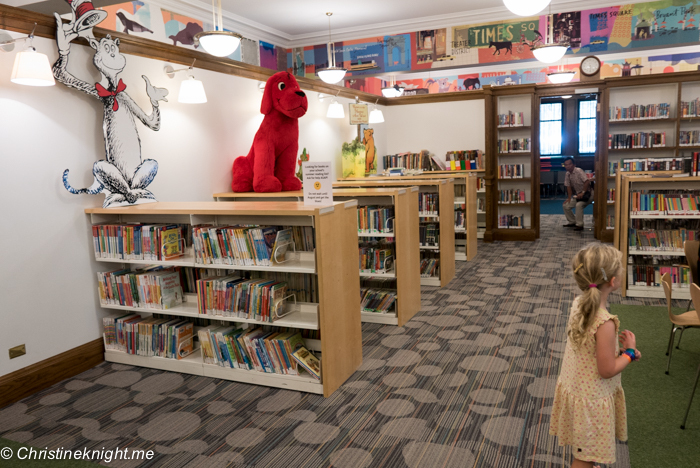 The library runs free storytimes suitable for kids from birth to age five. The full program is on their website. 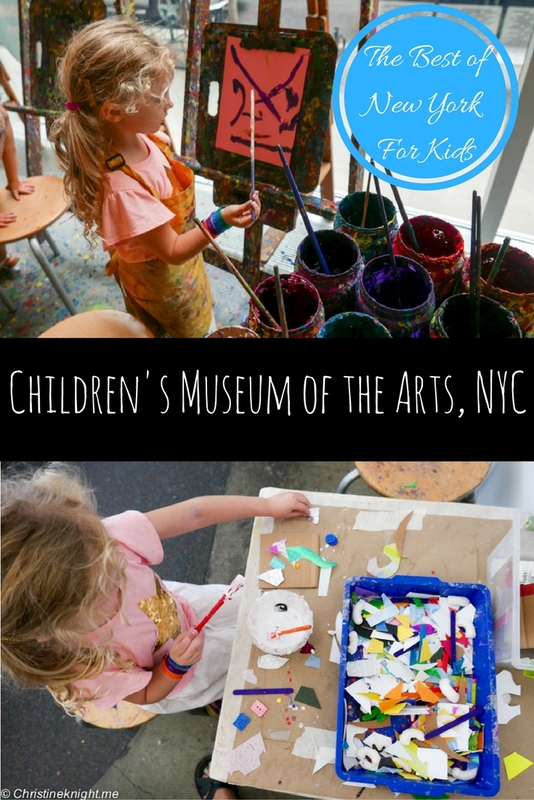 Little artists will love New York’s Children’s Museum of the Arts, a hands-on art museum dedicated to engaging kids aged 10 months-15 years. 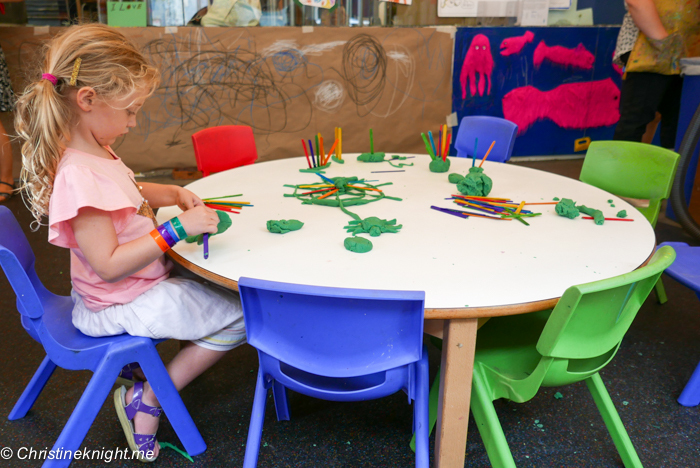 While the museum runs many hands-on programs throughout the year, we just love to drop by for a creative day out whenever we are in town. 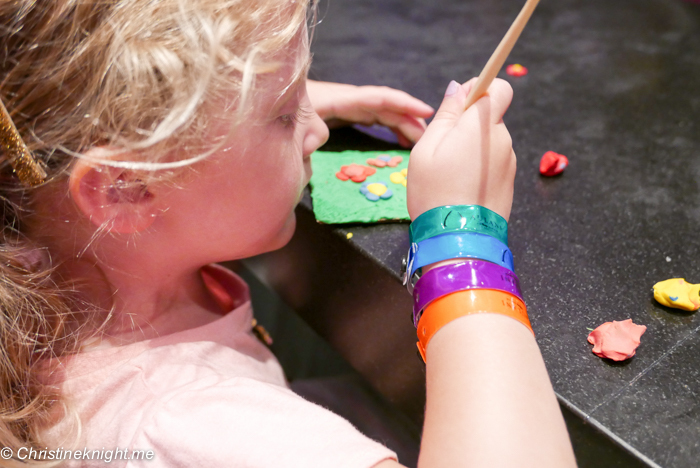 Explore the current exhibition in the Gallery and join in exhibit-themed workshops. 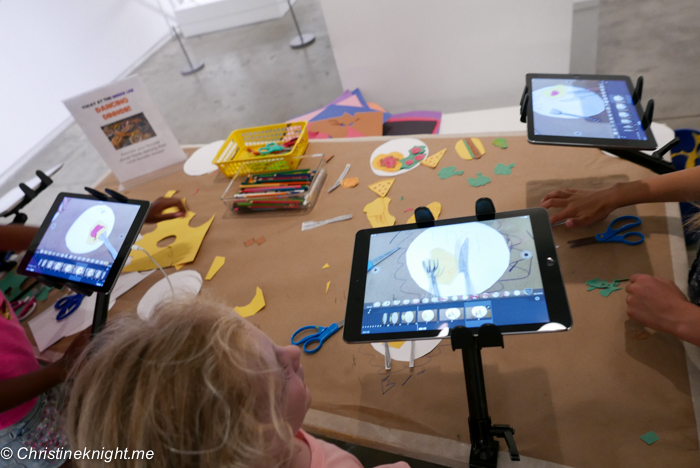 In the Media Lab, learn how to animate or watch a short film made by CMA students. 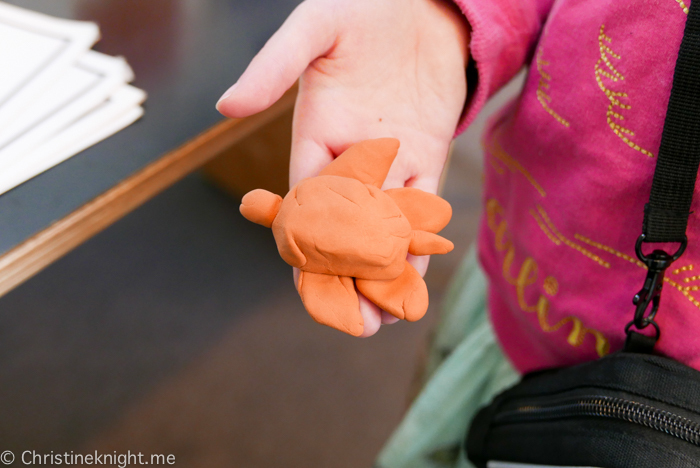 Mould a scene from your imagination at the very popular Clay Bar (ages 5 and over). Upon request, record a song, speech, or score a soundtrack in the Sound Booth (only available on Thursday, Saturday, or Sunday). 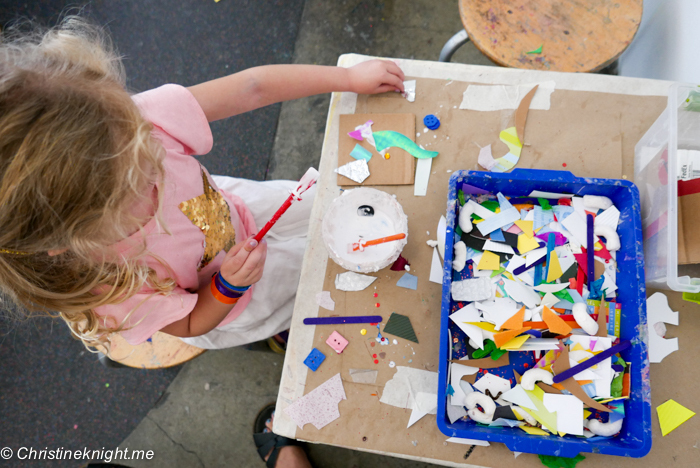 Kids under five can get messy with art materials in the WEE Arts early childhood studio. 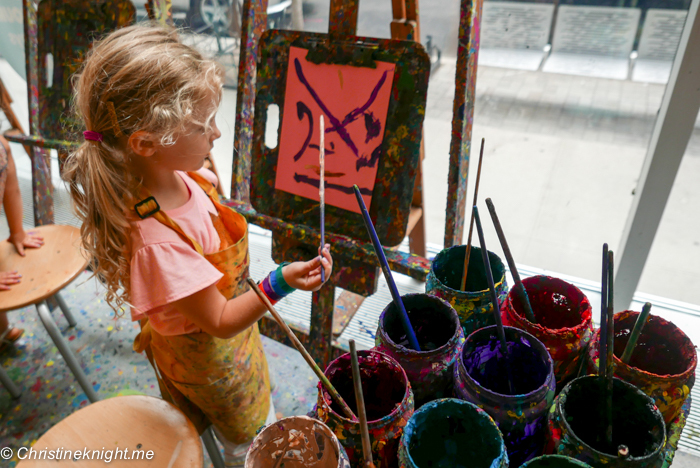 Head to the Fine Arts Studio is to paint, draw, sculpt, or sew an original masterpiece. The Clay Bar is one of the most popular stations so sign up for a 35 minutes session as soon as you arrive then check out the other areas of the museum while you wait for your time slot. 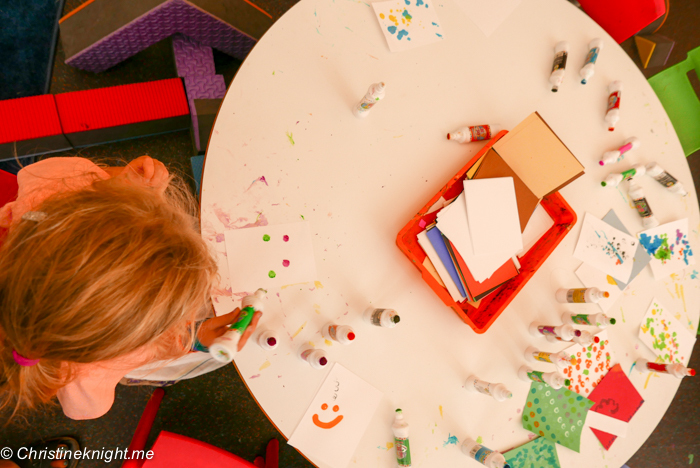 The WEE Arts Studio for kids under five is open Monday, Wednesday, and Friday from 12-3:30pm Thursday, 12-6pm, and weekends from 10am-5pm. The studio is also open for WEE Arts Drop in sessions when the museum is closed to the public every Monday through Friday from 10:45 AM – 12 PM and Wednesday from 1:45-3 PM. Prepare to get messy! While there are smocks provided, dress your child in clothes that they can get paint on. 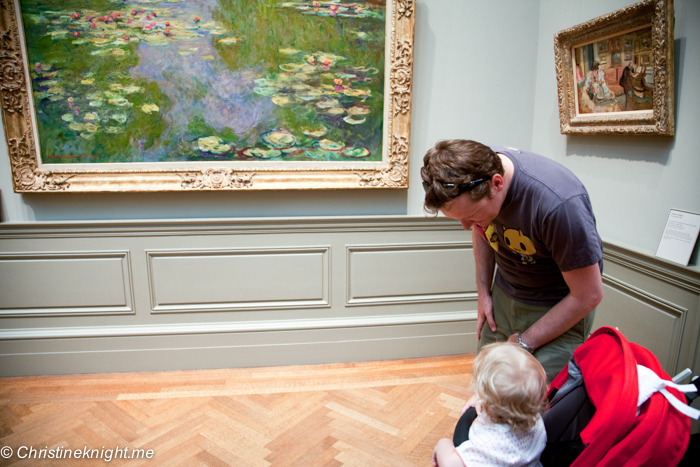 Right, so this cold snap means we need to find places that are warm and entertaining for a toddler, FAST. 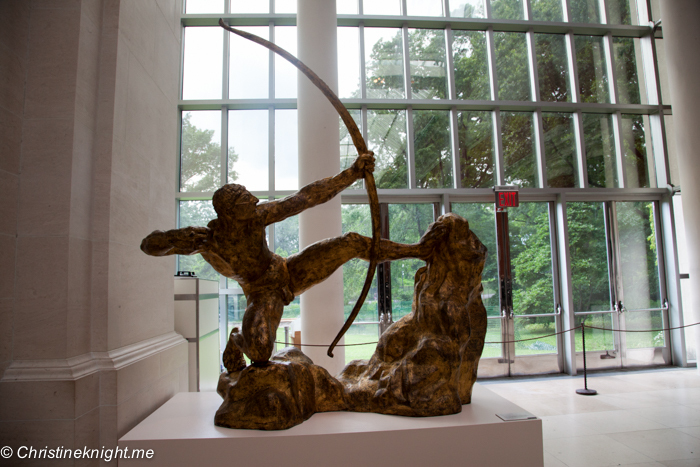 The American Museum of Natural History (AMNH) is the the perfect place to take an active kid. 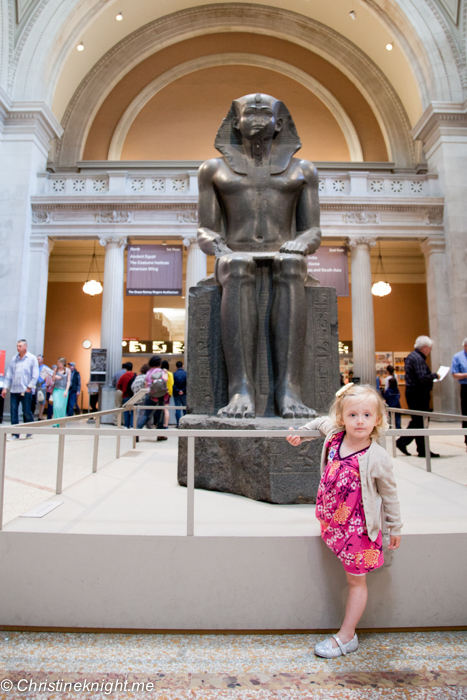 It has enough rooms, exhibits and general cool stuff to occupy kids of all ages all day — and their parents too (praise be!). 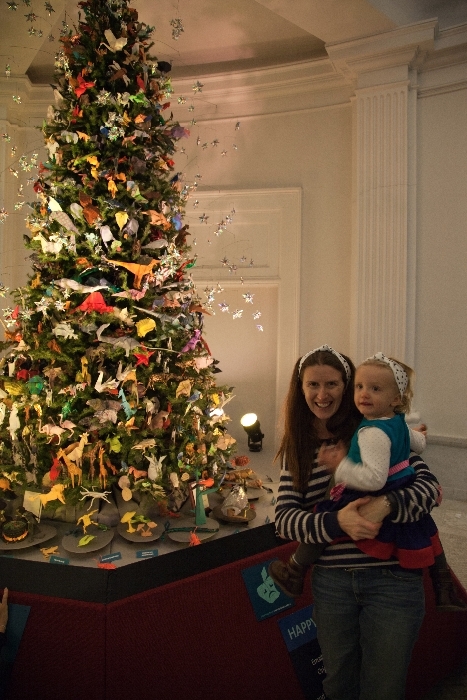 The Origami Holiday Tree is a tradition that goes back 40 years at the museum. Volunteers start folding the ornaments in July to complete the hundreds of creatures that are displayed on the tree. Every year the tree has a different theme — this year it’s Wicked, Wild, and Wonderful, in honor of the Museum’s new exhibition The Power of Poison. The animals are mostly easily identifiable, even for toddlers, so you can easily spend a long time just at the tree, asking your toddler to show you the different animals, and pointing out those they they might not be able to identify themselves. It’s also a good photo op. Everyone’s favourite dinosaurs are crowd pleasers for the toddler set too. 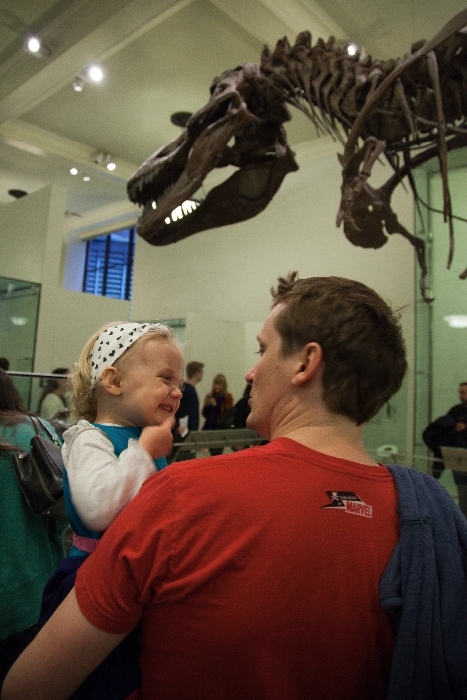 We like to let Cheese loose in the dinosaur rooms and watch her roar at the T-rex. 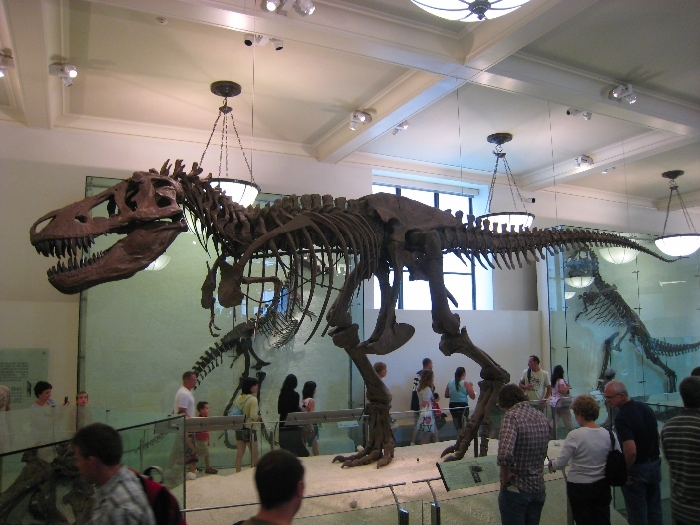 If your kid (or spouse) is a dinosaur freak, take the “Dino Tour” suggested by the AMNH website to help visitors take in all the dinos on offer. The most entertaining part of the dinosaur exhibits for us is when Cheese tells her dad that the T-Rex needs to brush his teeth (see pic above). 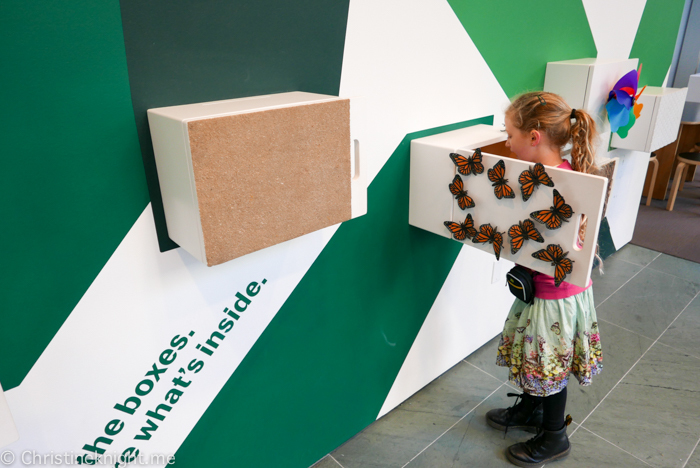 These beautiful insects flutter into the museum every year. 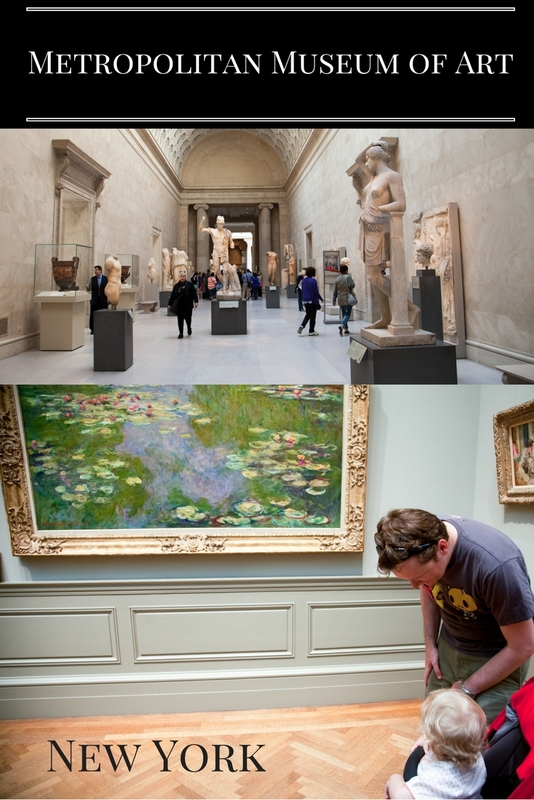 Entry is timed, so you need to buy a ticket for this special exhibit, and play close observance to the rules. I’d suggest taking only babies or older toddlers who can follow directions into this exhibit, as the butterflies are within toddler-reach at all times. 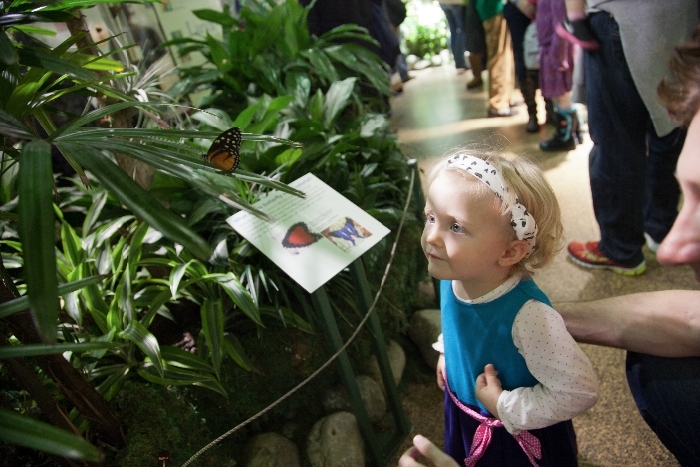 The butterflies like to land on visitors — making for some very exciting times for toddlers when they experience their light touch. 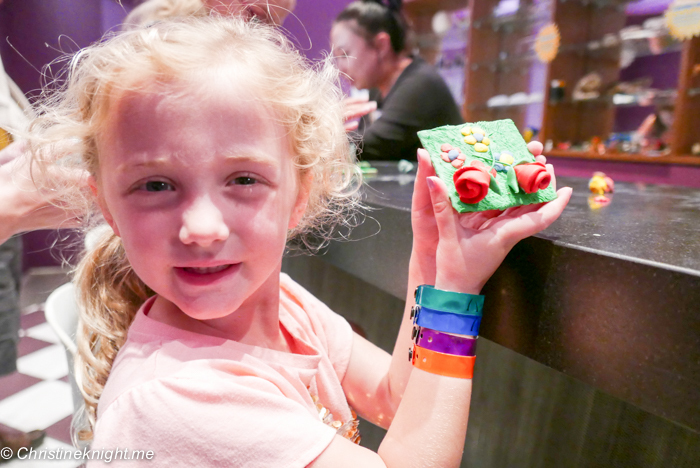 An enchanting experience, not just the toddlers. 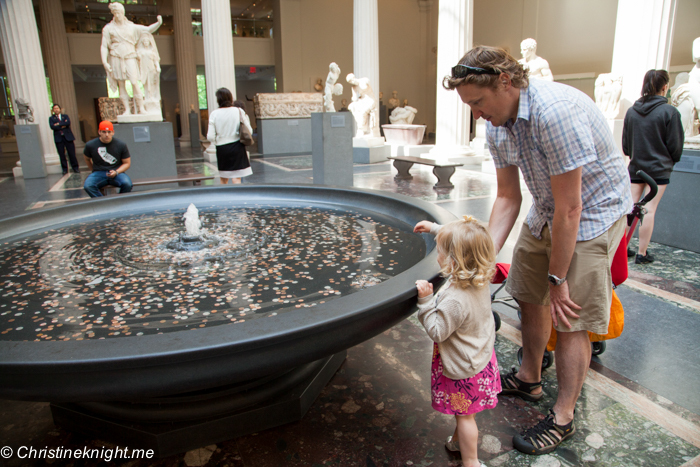 This exhibit is fascinating for adults, and fun for kids. 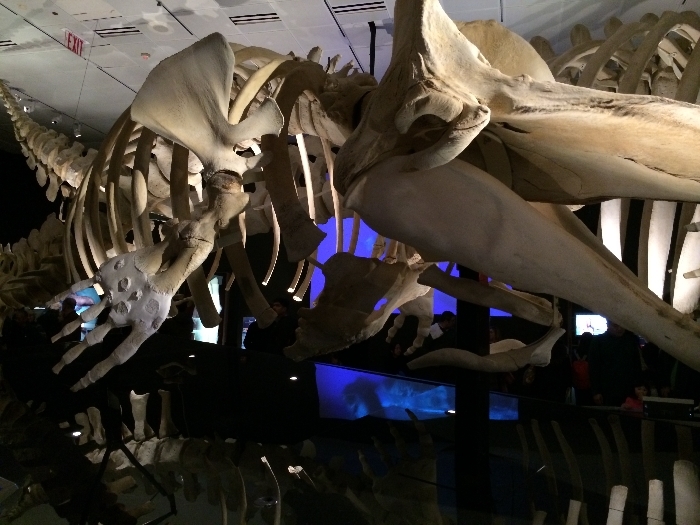 There is a life-sized whale heart that kids can crawl inside, and a massive sperm whale skeleton. Cheese’s favourite part of the exhibit was the sound chamber where you could spin a wheel and select a whale, and then listen to its distinctive sounds. This live exhibit features frogs in bright orange, blue and red. 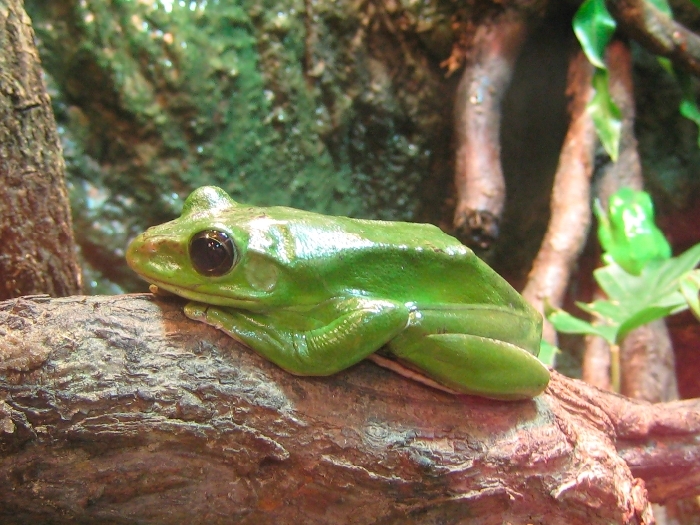 Toddlers and kids of all ages will enjoy seeing such a large variety of frogs from around the world. It’s a rare chance to get up close to these critters, not to be missed for frog-lovers of all ages. 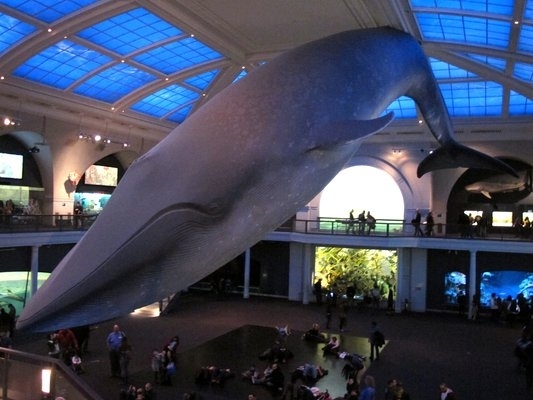 The 94-foot-long, 21,000-pound model of a blue whale hanging from the ceiling is a must-see for every visitor. The hall has recently been renovated, and now features 750 sea creatures, including computerized glowing jellyfishes, and includes modern technology in the exhibits, such as high-definition video projections and interactive computer stations. The best spot in the room is lying directly underneath the whale on the floor. No kidding. It’s amazing how different the world looks from down there. After (or before) your visit, check out these delicious places to eat that are right around the corner. On a stupidly hot day, we were dying for an indoor space with super strong air-conditioning, where Cheese could also run around. 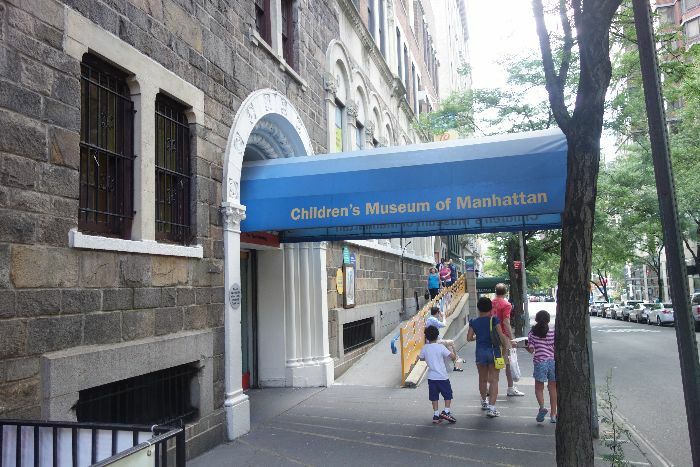 We caught the A/C train straight up to 81st street to check out the Children’s Museum of Manhattan (CMOM). 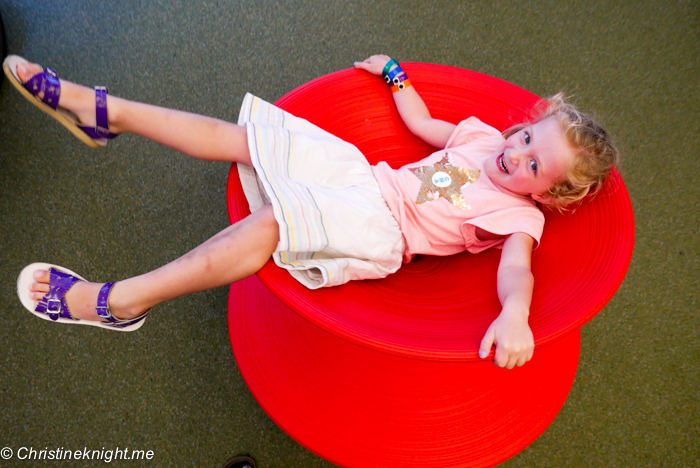 The CMOM is a five-story paradise for kids. 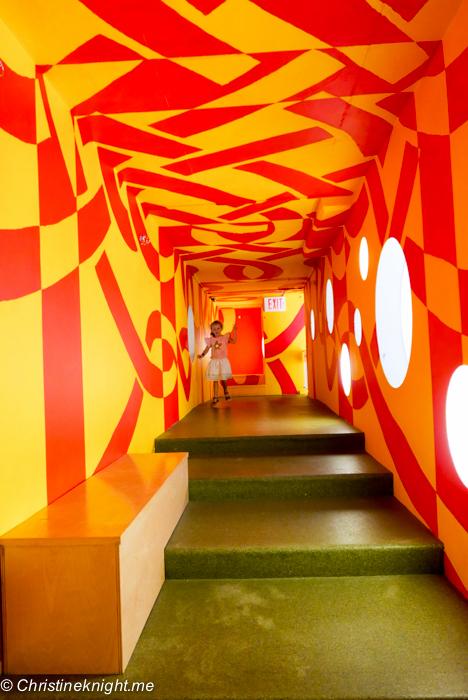 Each floor contains either permanent or special exhibits, which are highly interactive, and suitable for children of all ages— from birth on up. 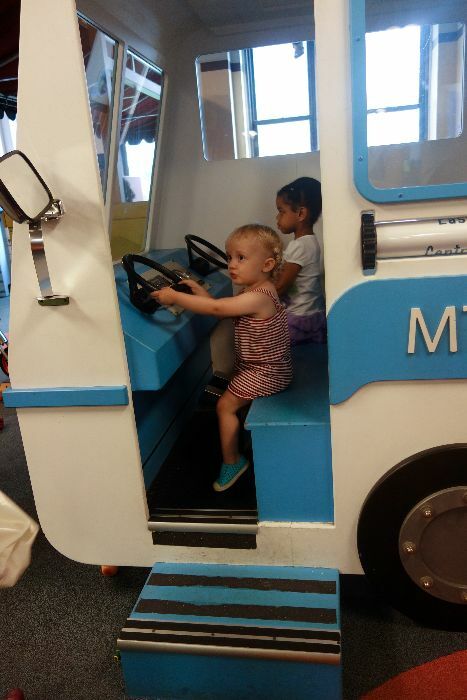 Cheese, at 22 months, particularly loved the “PlayWorks” exhibit, featuring a fire truck, MTA bus and a giant talking dragon who “eats” letters. Riding atop the letter-eating dragon. Other exhibits of note included an outdoor water play area in summer, a mural wall for kids to play on, a sand pit, a soft play area for babies and a Dora The Explorer rainforest world (with a jungle canopy and play exotic animal exhibits for kids to discover). We went on the 4th of July holiday and it was not overly busy, which you’d expect on a public holiday (maybe everyone was out barbecuing?). 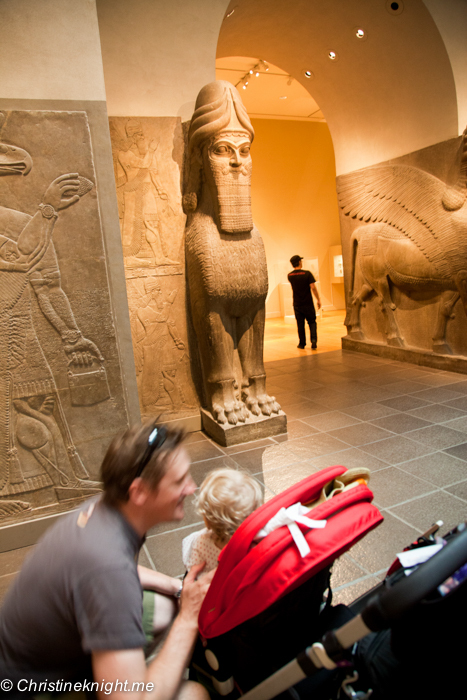 You’ll need to check your stroller at the entrance, so bring a carrier for kids who aren’t strong walkers. Also, there are easy-to-access bathrooms with change tables available. After working up an appetite we ducked into Cafe Lalo across the street (which is worth a visit on its own any day!) for a snack. “Lalo’s Special”: frozen yogurt with fresh berries and an apple turnover. Since it was so hot, we each ordered the “Lalo’s Special” ($11.50). It’s a bowl of frozen yogurt with your choice of berries, fruit or nuts, and a fresh-baked breakfast pastry of your choice. We both ordered ours with the berries and went with an apple danish and cranberry scone since they were only two remaining pastries. As always, the yogurt was perfect, with the fresh mixed berries giving sweet zings of flavour to the tart yogurt. While the pastries weren’t our first choices (I’d usually go for a pain au chocolat, and Alec a plain crossant), they were delicious. The apple danish was flaky with big chunks of apple, and the cranberry scone was densely packed with sweet bursts of cranberry. We let Cheese share our dishes—she loved the yogurt and berries most of all. 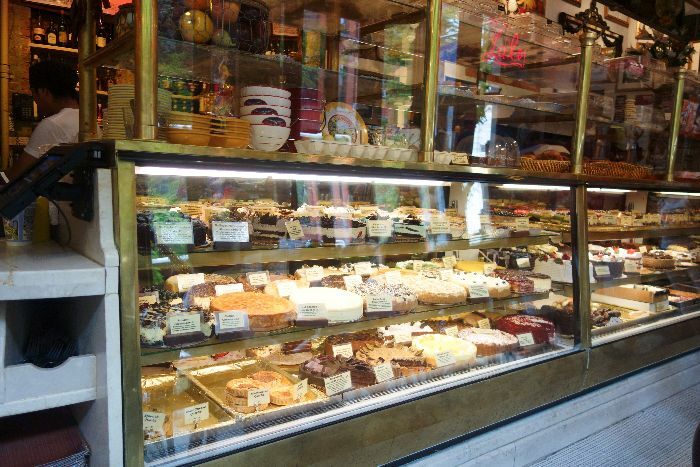 Cafe Lalo is actually known for two things—desserts (they have over 100 whole cakes, pies and tarts available), and for a famous scene in the movie “You’ve Got Mail“, starring Tom Hanks and Meg Ryan. 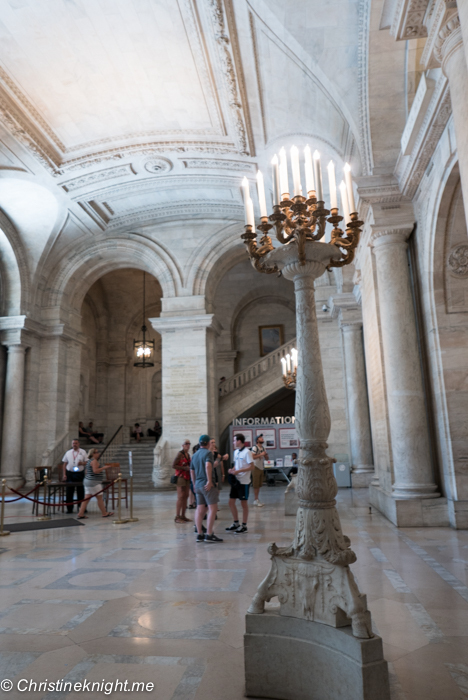 As such, it’s always packed, either with lovers of sweets like myself, or busloads of tourists—who showed up at just the same time we did that day. The tourists mostly stayed in the front of the cafe to order a dessert to go, so it wasn’t as obtrusive as you’d expect. 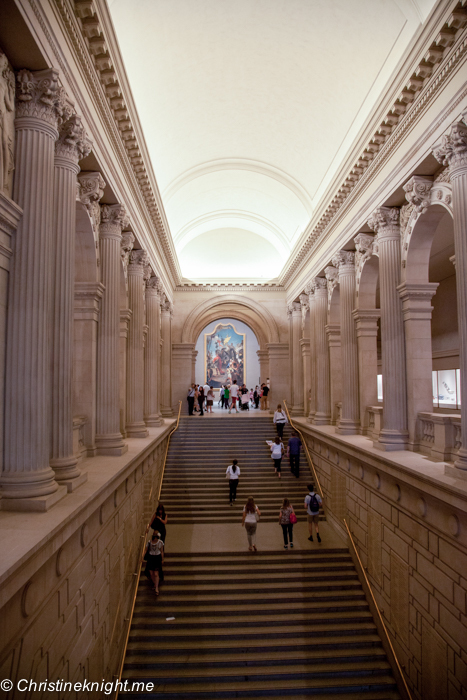 The interior—with its walls covered in Toulouse Lautrec-esque prints—is charmingly Parisian. 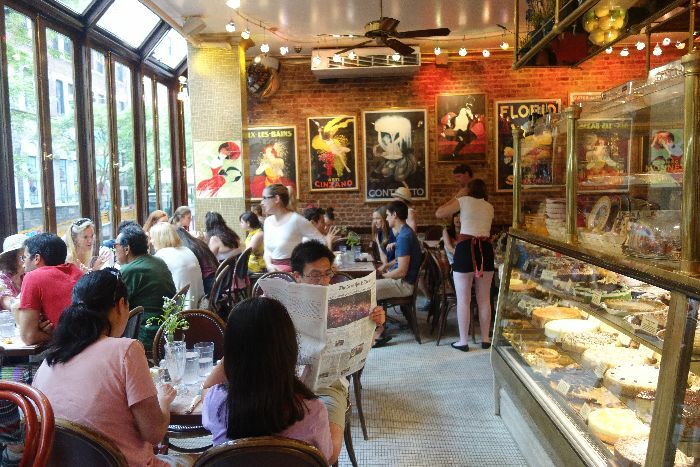 If you block out the decidedly non-European voices around you, it’s easy to imagine you’re in a cafe in Paris. 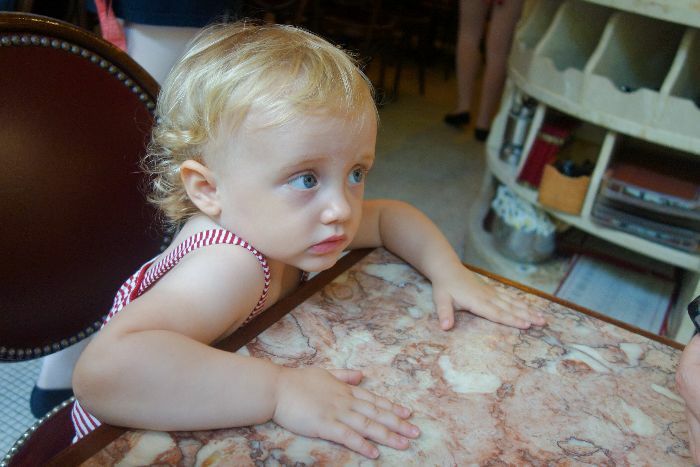 Taking children to Cafe Lalo is a mixed bag. 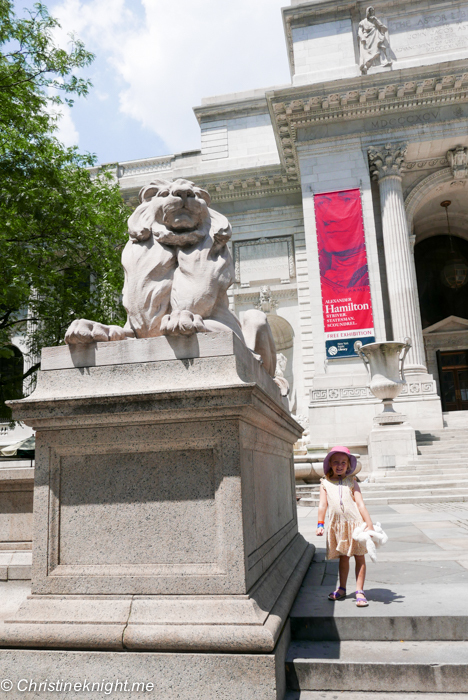 They’re not especially set up for kids, so come prepared for your visit —you’ll need to leave the stroller outside, and be sure to speak up and ask for anything you need for your child. 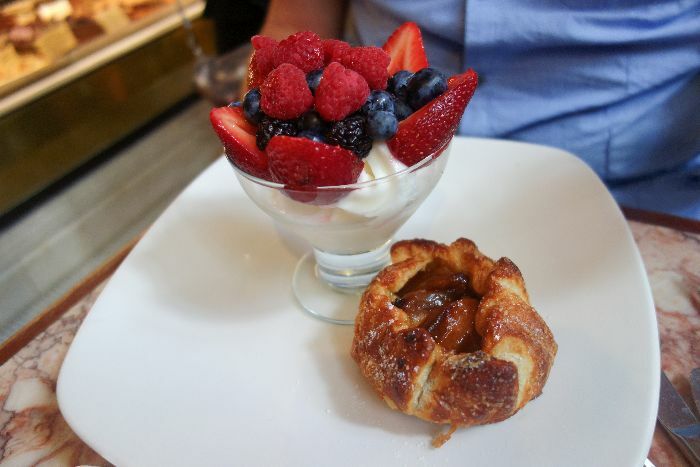 Last bite: Drop by for a snack or dessert for a touch of Paris on the UWS. Kids are welcome—order them a pastry or share a “Lalo’s Special” for a fun afternoon (or morning) treat. Stroller storage: You can’t bring your stroller inside, but they’ll store it for you somewhere mysterious under the restaurant. Easy access: No. Quite a few steps. 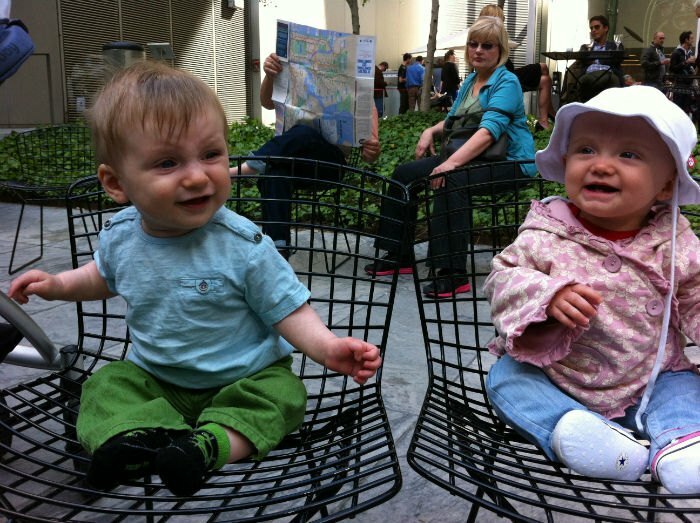 Change tables: No. The bathrooms are pretty small. Kids’ menu: No, but there’s so much to choose from, from bagels and muffins to steamed eggs or homemade waffles. Hours: Mon-Thur 8am-2am; Fri 8am-4am; Sat 9am-4am Sun 9am-2am. Holidays until 4am. Hours: Sun-Fri 10am-5pm; Sat 10am-7pm. Closed Mondays. 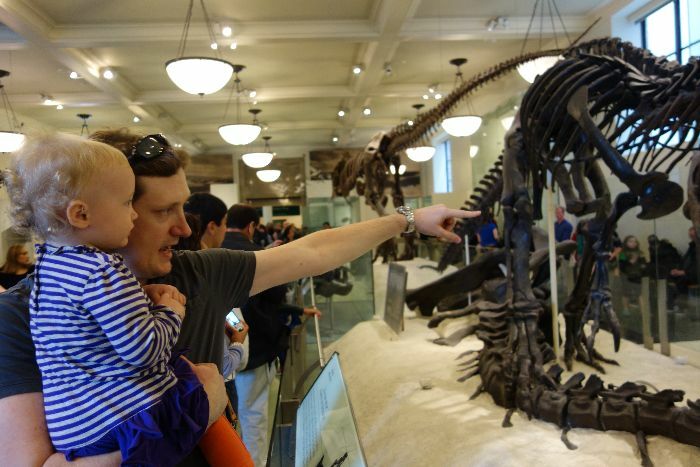 One of the best places to take kids of all ages is the American Museum of Natural History. 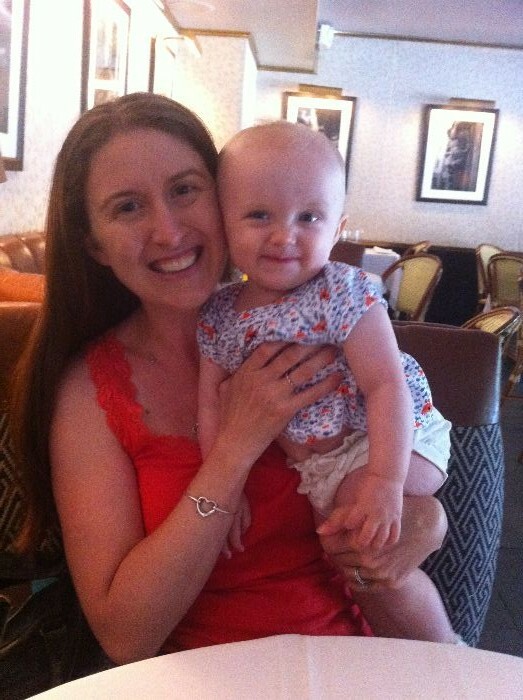 We’ve been taking Cheese there since she was in utero – true story. 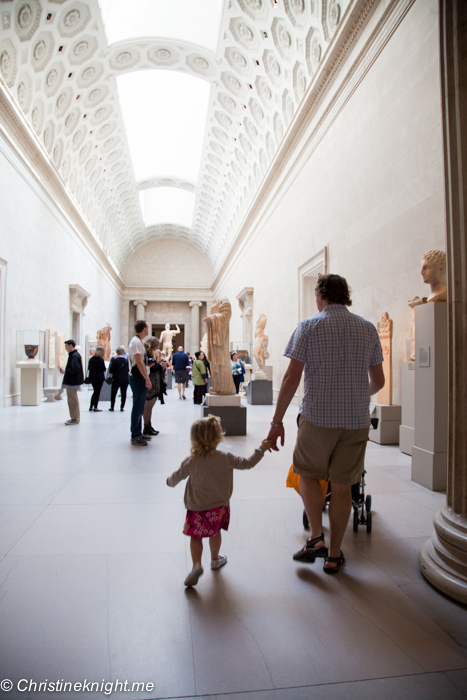 Whether you’re taking your baby, toddler or bigger kid, there’s literally something for everyone to enjoy. Babies are happy to look at ceiling fans, so the constant changing scenery of exhibits makes them happy to just watch everything pass by. 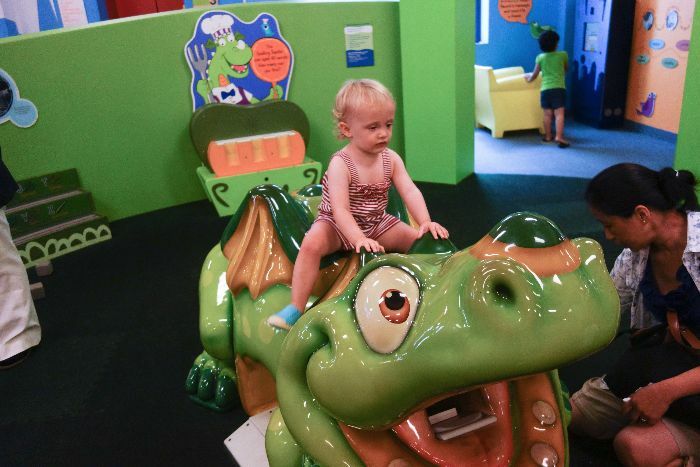 Toddlers love the dinosaurs and giant whales, and bigger kids can get involved in the exhibits. Before a trip to the museum, you really need to food up to get through the day. 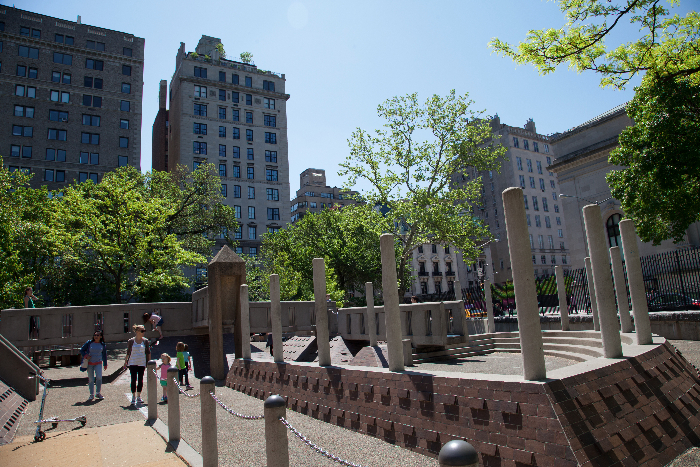 Instead of eating at the museum cafe, check out these nearby restaurants that you and the kids will all enjoy. 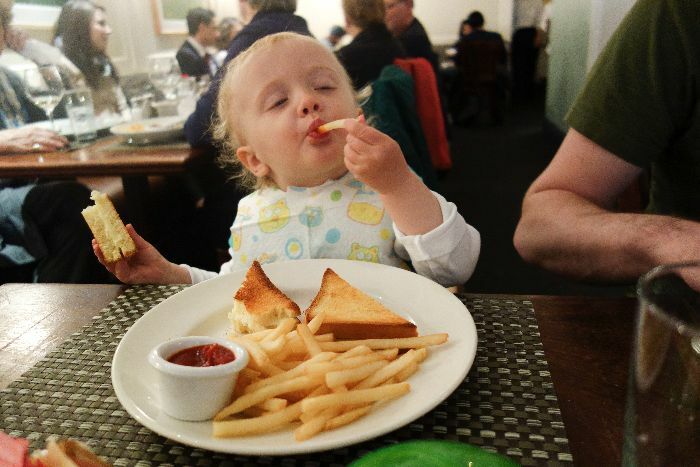 Cheese enjoying her grilled cheese and fries at Sarabeth’s West. 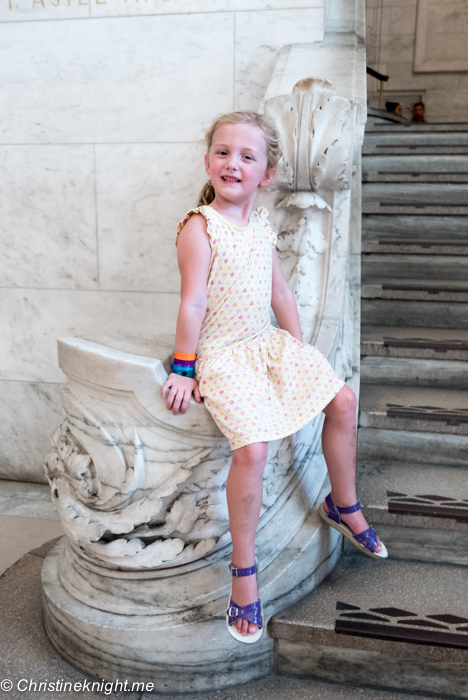 Book a table for a finer dining experience at Sarabeth’s West, where kids are welcome (and usually present, in abundance!). 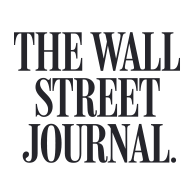 Try their four flower juice and the ricotta pancakes or omelette. 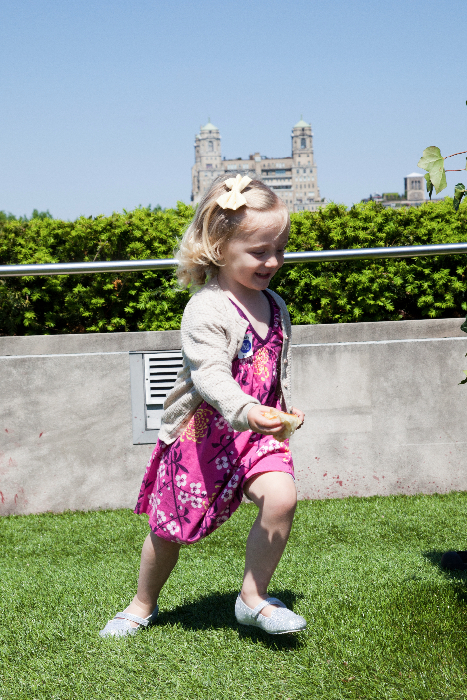 No need to order for toddlers – they’ll steal your delicious brunch right off your plate. Ask for a kid’s sippy cup to entertain young ones and buy you a bit more time. Me and my Cheese at Isabella’s. Not only is the food amazing at Isabella’s, but the staff really go above and beyond to make families feel at home. Waitstaff happily entertained Cheese when we last visited, as well as delivering fast service and perfectly cooked food. FYI I had an omelette and it was devine. Last tip: be sure to book a table as they’re super popular and get busy on weekends. “Purveyors of yumm”, Sugar and Plumm are bright, cheerful and full of treats. 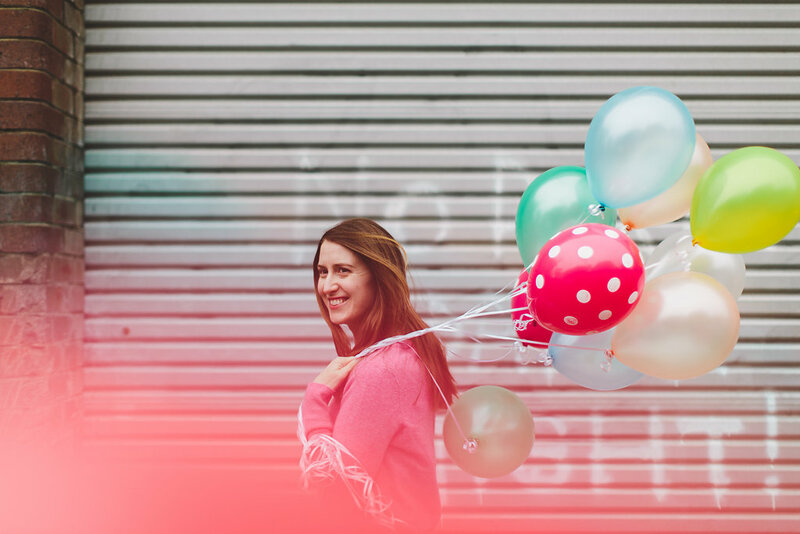 They deliver a great brunch menu, sure to delight everyone in the party, regardless of their age. 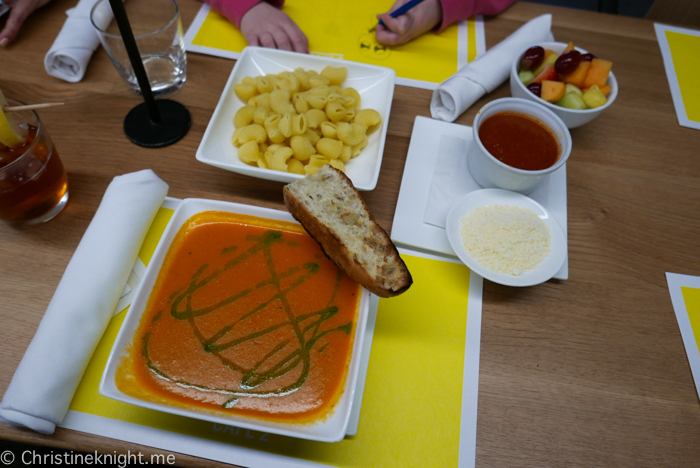 Kids are catered for with an innovative menu, sippy cups, crayons and a menu to colour in. The drawback: no reservations, so expect a long wait on weekends. Don’t take the shake from the baby. It’s bad. Fast food doesn’t necessarily mean bad food, as proven by the ever-popular Shake Shack. 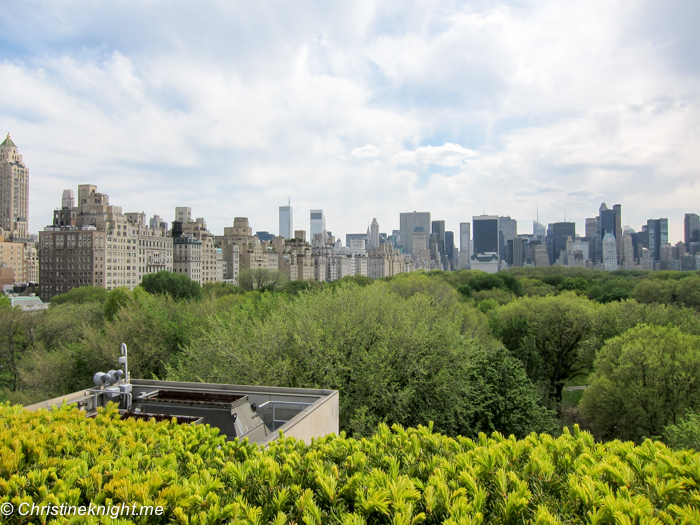 Right outside the museum, and only a block from Central Park, this is the best bet if you’re in a hurry. 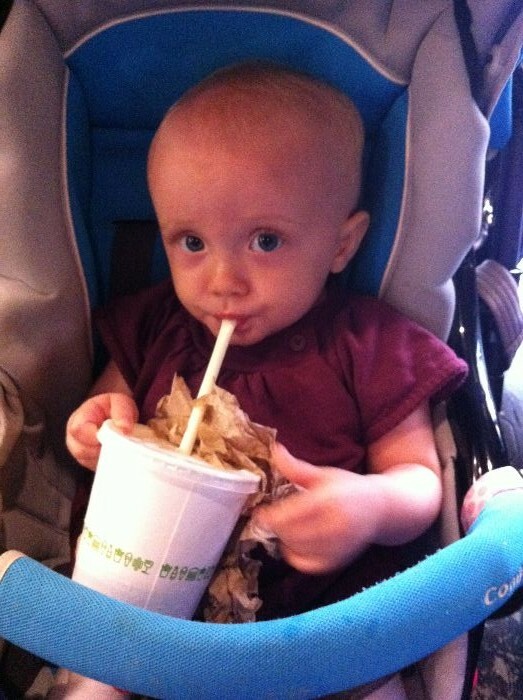 Solid burgers, fries and shakes will please most fussy eaters. The shakes are an especially big hit with the toddler crowd. 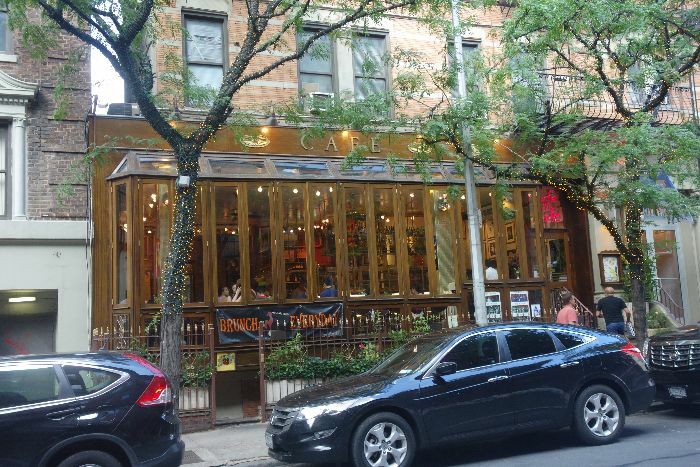 They have high chairs and change tables, plus a downstairs rec room with extra seating, so be sure to check it out if the street level area is packed.